If you don’t think customer feedback is important, then you probably don’t have many customers. The relationship between a business and its customer base is the barometer of its well-being. If you’re losing touch with customers, then the business is in trouble. But the channels of communication between a business and its customers are often not clear. It can be like a game of telephone, where you’ve got so many points of contact between customers and executives that the message that finally makes it to those in charge is muddled. Gathering feedback regarding your product or service not only improves your business process, but it makes the customer feel heard and involved. Such involvement brings your customer back and makes them dedicated to your brand. And although we don’t like hearing it, the truth is that even bad feedback is useful if you have the tools to create a plan and apply it. There are various aspects of customer service that a business can focus on, be that onboarding or content marketing to get insights on the customer journey. There’s also data collection, which is useless unless it is used to follow through with action. Then deciding on the channel to collect and visually analyze that data is crucial. Once you have made these choices, you can begin to apply some methods to better collect customer feedback. Here are five that are especially productive. If your business is driven by web sales, be it a product or a service, getting them onto your site is only the first hurdle. Once they’ve landed on your website, how do you keep them there? One way is to offer an opportunity for their questions to get answered. A Frequently Asked Questions (FAQ) section has been the standard for so many years as to feel antiquated. For one, it assumes the business knows the questions that its customers will ask. A better solution is one in which the customer, not the business, has ownership of this exchange. While an astute business might know what its customers most common questions are, having a live chat function is a way to put that power in the hands of your customer base. That way you get information and can provide direction, while sales are managed in real time. Speaking of old-fashioned, let’s talk email. It was once the model of future communications, and yet each day it begins to feel more like snail mail compared to chat, and other more immediate means of engagement. But don’t count it out just yet. Email remains one of the most valuable tools businesses have to gather candid customer feedback. Email is at its most effective when customers get a fast response, and an organized system is created to collect, manage and digest customer feedback in order to send follow-up emails. The first thing to do is set expectations. Most customers are not going to leave feedback because they feel it goes into the void and will never be read—let alone responded to. Therefore, when seeking feedback via email, give the customer a definite timeline in which you’ll get back to them. By doing so, especially once you write back and initiate a dialogue, there’s an opportunity to build bonds and strengthen customer loyalty. Of course, this feedback must be well-organized to reap the benefits. For example, you can create boards with columns for customer requests, how you plan to respond and then a roadmap on what is being worked on. Each card on that board is an individual customer, with contact info and whatever feedback they provided. Kanban boards can prove a useful project management tool for executing this strategy. An even older method of getting customer feedback is the survey, and this old dog still has a few tricks up its sleeve. Surveys continue to be popular, especially online surveys, and that’s because they work. There are at least two ways to gather information with a survey, which is the long or short form survey. Either way you go, don’t ask too many questions. That’s a sure way to lose a customer’s interest or have them just speed through the survey. To keep the survey focused, ask only questions that serve your end goal, and it’s easier to make good questions if you’ve set SMART goals. Each question must have a clear purpose. Don’t ask for information that you’re not interested in using. You want short, actionable answers, not rambling essays. It doesn’t hurt to start with an open-ended question, meaning something that’s not multiple choice, so the customer might surprise you with their answer. It could be something positive, such as what do you love about the product or service. There are online and in-app survey tools that can meet your customer at the point where they are in fact interacting with your product or service. This is the point in which the data you collect is going to be most accurate and helpful. If it feels as if we’re going backwards technologically, well, that’s because the newest method isn’t always the best. While it’s true that many people (especially younger ones) are less likely to want to interact on the phone, if you can get a customer on the phone there is no better way to understand them. The phone is a more personal and intimate communicative tool. Surveys, emails and even chat are still a distant way to connect. There’s a virtual wall that exists between the two parties with these technologies. Phones are a technology, too, of course, but the hurdle to clear is lower in terms of having a more authentic conversation about the product or service. For one thing, tone is always lost or less clear when written. Hearing a person’s voice opens up a whole other dimension to understanding. The call can also help to get a customer excited to speak to a real person with whom they can express how a product or service could be improved. The way to get the most out of a phone conversation, though, is to have the person making the call for the business genuinely want to understand the customer. If the customer senses that they’re just going through the motions, the whole thing will backfire. Do some research before calling. What is the best time to reach a person when they’re willing to give you some time to actually converse honestly? Also, it’s important to remember that a conversation isn’t the same as a survey, so don’t overly structure your script so it reads like a battery of questions. You probably remember seeing a suggestion box in the corner of an office you’ve worked at. There was a pad besides it and a slot to slip in your note with what you think could be improved in terms of office procedure. And there was a lock on it to both symbolize and make sure your suggestions were private and anonymous. The modern version of this is a suggestion board where customers can offer a business feedback to the company and start conversations revolving around the product or service with other customers. Customers can rate the comments to how helpful they are. It’s a way to create a space for customers to feel empowered and build community, but it also offers a wealth of customer feedback for the business. The board gives businesses insights into what customers want as it relates to what they most talk about or like. True, this is likely a squeaky-wheel selection of your customer base, so you’ll want to keep in mind that the customer isn’t always right. But if you make the board easy to navigate, searchable and find ways to drive a diverse customer base to it, it’s a great way to know what your customers think. Collecting actionable customer feedback is the first step to establishing excellent customer service at your company, and customer service is a quick way to set your business apart in today’s automated, online world. Companies as diverse as Trader Joe’s to the Ritz-Carlton have benefited from good customer service. For example, Trader Joe’s is not wedded to routine and will break with its own rules to help its customers. While the Ritz-Carlton gives its employees incentives and even control in delivering the kind of customer service that puts guests in priority. That kind of commitment to customer service has helped make those businesses two household names. Customer feedback is just data, and data is information that needs managing. That is, naturally, a project, which is why you need a tool to control all that feedback in an effective way. 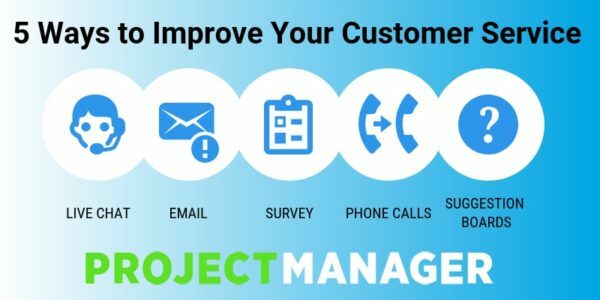 ProjectManager.com is cloud-based project management software that can help you plan, monitor and report on your customer feedback initiative. See how it can help you by taking this free 30-day trial now.